Lynn Davis holds degrees in Political Science and French Literature from the University of California, Santa Barbara. 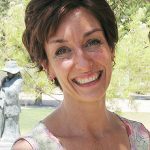 She brings more than 16 years of nonprofit administration and fine arts management experience to her position, most recently as Director of Arts & Culture for the Tucson Jewish Community Center. Lynn looks forward to building upon SGS’s reputation as a center for arts and arts education and helping create a platform for emerging and professional artists. 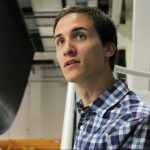 Nick Letson received his BA in Journalism from the University of Arizona in 2010 and studied Literature and Spanish at the Universidad Catolica de Argentina in 2009. As a journalist his articles appeared in Caliente, La Estrella, and on the Sunday front page of the Arizona Daily Star. Nick joined SGS in 2013 as its Communications Director and fell in love glass as a visual arts medium. In 2014, Nick was invited to the Glass Art Society Conference in Chicago to be a speaker at the At Risk Glass forum. Nick also serves as the vice president of the board for the Southern Arizona Attraction’s Alliance and volunteers as a coach for Odyssey of the Mind, a middle school program. 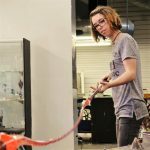 Today, Nick’s experience in communication, photography, graphic design, and social media helps Sonoran Glass School’s inspire people of all ages to discover the wonder of glass art. Virgil was born in Indiana and grew up surrounded by the arts, originally studying dancing and ice skating. He found he was fascinated with the visual arts when he discovered glass as an artistic medium. Virgil first learned glassblowing techniques in the Spring of 2014 at Soverow Glass in Birmingham, Alabama. 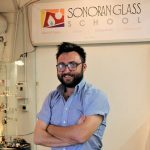 Since moving to Tucson and studying at Sonoran Glass School, Virgil has excelled as a glassblowing student and now teaches several beginning level classes. 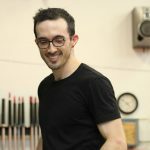 He is a regular assistant to intermediate and advanced classes as well as an instructor for Make-Your-Own-Glass-Art Experiences. Virgil has also been an assistant in SGS Visiting Artist Workshops, like Josh DeWall’s Faster, Thinner, Better workshop at Sonoran Glass School in February 2015. Since 1996, Bronwen has been working with glass and is an accomplished glass artist. Her knowledge of flame-working is extensive and thorough and an innovator of style and techniques. Bronwen is exactly what the flame shop needs and we are very excited to include her as part of our family. Nan’s been a serious glass artist for nine years but became obsessed with glass art after her very first lesson. 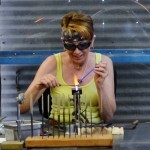 She started collecting beads and stringing them together 30 years ago, and her desire to create her own intricate beads drew her to making glass beads at a torch. She’s studied under the likes of Margaret Zinser, Bronwen Heilman, and Bandu Dunhum. Nan is a member of the International Society of Glass Beadmakers and her work’s been published in glass art publications like Lammaga in Japan and the Flow Glass Art Quarterly here in the states. Jason Marstall is a Hot Shop Instructor at SGS and an Assistant and Gaffer at Philabaum Glass Gallery & Studio. Born in Tucson, Jason began blowing glass in 2003 through a cooperative program between SGS and the University of Arizona. Today, he continues to build his repertoire of advanced skills in all glass disciplines. Some awards and distinctions include the Arizona Designer Craftsman Award for Art in Craft Media (2006); An assistant to Laura Donefer and Jeff Mack for the Corning Museum of Glass Artist in Residency Program and 3rd Place in the 2013 Tucson Glass Festival. Jason’s perpetually evolving style is apparent in his diverse array of work, from studies in blown forms and figurative sculpture to fine Venetian goblets and large carved vessels. 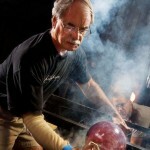 His quest for knowledge and technique in glass is an endless endeavor, and his work is often done in series in order to fully investigate, develop, experiment with a particular technique. Alex has been drawing, painting and sculpting since she was a small child. Alex committed full-time to an artistic career after studying science and engineering at the University of Arizona. 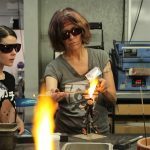 Her first class in glassmaking was at the Sonoran Glass School in January of 2015. Since then, she has explored every area of glass art with enthusiasm. Alex’s artistic range also includes metalworking, blacksmithing and bronze sculpture. She has her own flameworking and art studio just a stone’s throw from a burger and beer at Barrio Brewery. 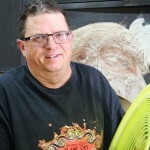 Dave is a glass artist who developed many of the original SGS programs and studios. He received a BA in Education in 1991 and has worked internationally in glass. He continues to work with SGS striving to further enhance educational programs and applications for glass in art, science, and technology. In 1973, Tom received an MA from University of Wisconsin where he studied glass with Harvey Littleton. Once he moved to Tucson, Tom started a glass studio in 1975, earned his MFA from UA in 1983, and helped orchestrate the first Glass Art Society (GAS) conference in Tucson that same year. He was co-chair for the 1997 Tucson GAS conference and received the AZ Artist of the Year award in 1998. In 2000, Tom and Dave Klein co-founded the Sonoran Art Foundation (now SGS). He has served on the Board of GAS, American Craft Council, Tucson Visiting Artists Consortium, and SGS.